An East German propaganda leaflet issued during the Berlin Airlift (1948-1949), when Stalin attempted to blockade the already geographically surrounded people of West Berlin into submission. American and British crews flew in food and other supplies, thereby demonstrating both the superiority of Western air capabilities and the extremes they would go to in order to check Soviet politicking. And so began the Cold War. 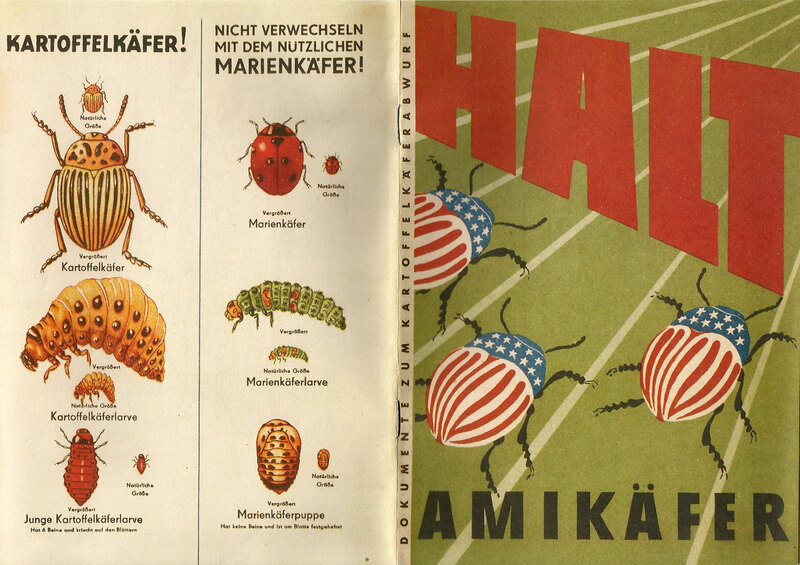 This leaflet about Amikäfer (“Yank Beetles”) claims that the airlift is just a pretext for ruining East German farming by dropping “imperialist weapons”: potato-devouring Colorado beetles (Kartoffelkäfer). The back cover warns about confusing them with harmless Marienkäfer (ladybirds). Ridiculous propaganda even by the standards of ridiculous propaganda, but I have to admit that the adaptation of the beetle’s markings into the Stars and Stripes is pretty good.